One of the most important features of aquariums, besides the organisms that live in them, is lighting. Light gives the fish reference as to how to act, because usually fish, depending on what type of fish they are (diurnal – active during the day or nocturnal – active during the night), tend to act differently during the daylight or night hours and the corals and other marine aquarium life need the light to be able to grow and live. So you really need to choose the best light for your aquarium and the organisms that live in it, otherwise they will languish and you will have wasted the money you put into creating your aquarium. But how to choose the right lighting for a saltwater aquarium? 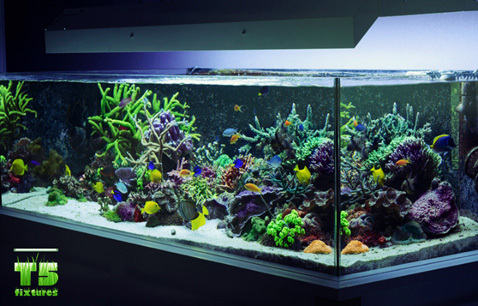 The simple truth is that aquariums that house corals and tropical fish such as marine or saltwater aquariums need light that is bright and intense. Anyone who have been to tropical or subtropical area will tell you that the sunlight there is much brighter and more intense than it is in any other climatic area. This means that saltwater organisms are used to getting a lot of light, because even though water absorbs a good portion of the light, still the light is brighter underwater in the tropics than it is in any temperate climate zone. So for saltwater aquarium you need to search for a light that will be able to emit powerful and intense light that is at least 10,000 or 20,000 lumens. The second thing that you need to think about when choosing lighting for saltwater aquariums is what color temperature the light will have. Color temperature is the measurement that is used to describe what the visible color of the emitted light is and it is measured in Kelvins. Saltwater organisms are used to being underwater so they need light that looks cool and is blue in color to reflect being in deeper open water and to boost the production of pigments. Because the higher the color temperature of the light is, the bluer the light they emit appears, this means that saltwater aquariums need light that has the color temperature starting from 6,000 Kelvins up to even 14,000 Kelvins. And lighting of this color temperature will not only give the fish and the plants in the aquarium the right color waves, but will also create an atmosphere of depth that is beneficial to marine organisms who are used to deeper waters. Also you definitely need to consider how much heat does your light radiates and how that can influence your aquarium and the organisms inside of it. For aquariums, no matter what type of aquarium you have, you should use lamps that run cool, because if lamps heat up very easily and radiate a lot of heat, then that heat will quickly transfer to your aquarium water which is not good. Although the water in saltwater aquariums can be warmer then in freshwater aquariums, it cannot be hot either or the fish and other organisms in your aquarium won’t be able to live properly. And because it is easier to purchase lights that don’t run hot in the first place than to install some type of cooling system to your aquarium setup, take the heat that each type of lighting radiates into consideration when you are shopping for your saltwater aquarium lights. And lastly, although this might not be important to everyone, I think that it is also very important to purchase lights that make your aquarium look good. Different lights can give the aquarium different visual looks, so you need to do your research and find the type of lights that make your aquarium appear how you like it. For example, different type of lights (fluorescent, metal halide, LED) in the same color temperature rage might give out distinctively blue or violet light that will affect how your aquarium and the plants and fish inside of it look, so first determine how you would like your aquarium to look and only then go out and buy your aquarium lighting, especially if you are planning to place your aquarium on display. Now that you know what you need to consider and look for in an aquarium lighting, you can choose the right lights for your saltwater aquarium more easily and later not regret the decision you made. Happy lighting!